When you are coming with Salman Khan for a sequel of a super-hit movie, you need chartbusters. 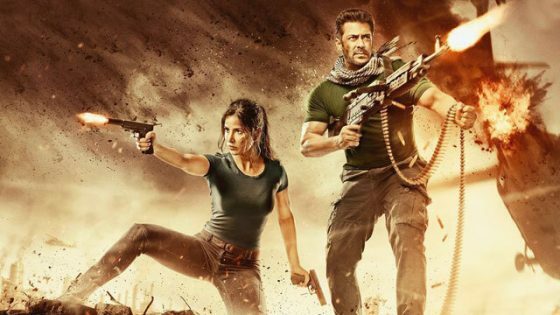 Tiger Zinda Hai surely has enough buzz with just two songs released – Swag Se Swagat and Dil Diyan Galllan but is it any better as a whole album? Let’s analyse. Every Salman Khan movie has a song which is specially composed for him and most of the times it goes on busting the charts. The Tiger Zinda Hai album starts with Swag Se Swagat and trust me there could not have been a better start. With an extremely catchy signature tune, the song is literally Irshad Kamil meets Vishal-Shekhar – EDM meets proper lyrics. My mother, not a proper Salman Khan fan has kept the main tune as her ringtone. This is the craze the song has generated all over. Boundaries can never divide our love for music! Atif Aslam singing Dil Diyan Gallan is surely special after all the controversies Pak artists faced last year. When Irshad Kamil writes, you listen; Dil Diyan Gallan has words describing a situation when you have to appease your partner. Beautifully sung by Atif Aslam, this is surely one of his best. Vishal-Shekhar, too, have done a wonderful job by placing the perfect instruments to add the feel. Dil Diyan also has a much more rustic reprise version sung by Neha Bhasin. Acing the lyrics with the proper accent, Neha adds the freshness to an already good song. High octane pumped up title song – Zinda Hai is sung by Sukhwinder Singh and one of the most underrated rappers of Bollywood Raftaar. The song starts amazingly well using the title tune of Tiger from the prequel, it goes up for the first 70 seconds when Vishal-Shekhar decide to drop the beat. A song is divided into three portions – music, lyrics and singing. Lyrics for this one did not match the buzz created by music. Still, it could turn out to be a good situational song in the film. “Avval bhi tu hi hai, aakhir bhi tu!” As the title suggest this song is a prayer from the nurses that get abducted in the story. Irshad spreads his magic wand in this one and makes this a song to remember for its words. Sung by Shreya Ghoshal, this again is a situational song. On the lines of Aye Khuda, Aas Paas Hai Khuda – it could surely be a song to pick up your low mood sparking a ray of hope in it. Sung by one amazing half of Nooran Sisters – Jyoti Nooran, Tera Noor is a fusion of two different genres. There’s a very thin line when you mix two genres and Vishal-Shekhar has achieved this by mixing Sufi and electronic music. It starts with heavy words but once you are in the song, everything starts getting lighter. Tiger Zinda Hai is comparatively a better album than its predecessor. It has depth and none of the songs seems to be forcefully annexed just for the sake of it. My potential playlist toppers are Dil Diyan Gallan, Tera Noor & Swag Se Swagat. The combo of Ali Abbas Zafar and Vishal-Shekhar have proved once again after Sultan – how to create some memorable music.